In SAP ECC5 and ECC6 New GL and Classic GL are two ways to implement General Ledger functionality. To perform functionality in Classic GL, provide a technologically superior way. In classic GL with New GL, SAP (Systems, Applications, Products in Data Processing) has consolidated the multiple totals table (GLT0, GLPCT, etc) into a single FAGLFLEXT Totals table. For reporting one Summary Table provides faster response time and flexibility. By adding customer defined fields FAGLFLEXT can also be enhanced. For segment reporting, the statutory requirements are defined by IAS accounting standards. The segment reporting is enabled by New GL as it has document splitting functionality. In Classic GL, the Standard Segment Reporting functionality is unavailable. Across functional area, business area and company code originating in CO Classic GL has the period-close reconciliation ledger functionality to synchronize FI and CO for cost transfers. 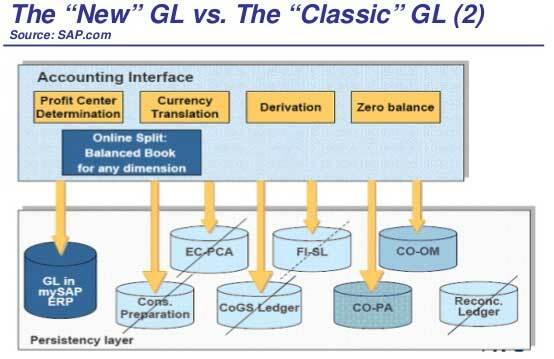 Instead of a summary posting done by reconciliation ledger during period-close, new GL has a real-time integration between FI and CO that happens with each transaction originating in CO.
For parallel accounting like SAP IFRS (International Financial Reporting Standards) and GAAP, New GL provides Non-leading ledgers. Using Account based approach the parallel accounting can also be implemented which is also available in classic GL. By segment and other characteristics, New GL has advanced drill-down capabilities.